As the name suggests, this is about vampires, but not (thank goodness) in a Twilight kind of way. 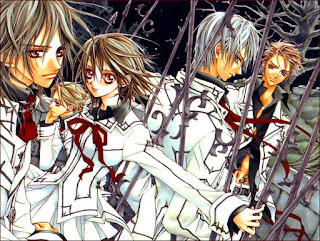 Vampire Knight is a manga mostly based around the goings on in Cross Academy, a school attended by two groups of students: the Day Class and the Night Class. But, the Night Class is full of vampires, which only a select few are aware of, including Cross Academy Guardians Yuki Cross and Zero Kiryu. Things do get much more interesting and complex when the story moves away from the academy and follows the individual stories of Yuki and Zero (and others). Vampire Knight takes vampires to a different level. Think upper class/lower class due to their blood type/lineage. For example, you have Kaname Kuran, a student of the Night Class and someone you'll see a lot of throughout the story, who is a pure blood, making him someone to admire. Then you have humans who have been bitten by vampires; these are classed by levels if I remember correctly. The vampires can also have abilities, such as ice, fire, and haemomancy (I think that's right). But not all the focus is on vampires. Well, that's a lie, because all the characters featuring in the story have some kind of link to vampires. For example, Zero turns out to be a vampire hunter (not exactly a spoiler because you'll know of this near the start of the story anyway), but as the story progresses you'll come to know of other links he has to the vampire world. This is the same with Yuki and the Head of Cross Academy etc. These do make the story much more interesting and add a sense of mystery, drama and romance, but at some points you may be left confused as to why certain things happened if you didn't focus. This can be said for the ending of the manga too, but you could link a story from the Fleeting Dreams to it so it makes more sense I guess. I have yet to read the other book Matsuri Hino released so I can't say what links there are between that and the manga. With all the complexity and mystery going on in the story, you'd think there's no time for action. But there is. And lots more than you'd expect. A vague but essential spoiler here when I say that most of the action comes from the time when the vampire world is in turmoil after certain events occur. They do add to the story too and make things even more complicated, but it doesn't drag and you'll come to understand what's happening soon after. For those of you wondering about whether there is an anime, yes there is. There are two seasons, Vampire Knight and Vampire Knight Guilty, but because of how it started to deviate from the manga, it was cancelled (I wasn't a fan of YukiXZero anyway at that point). 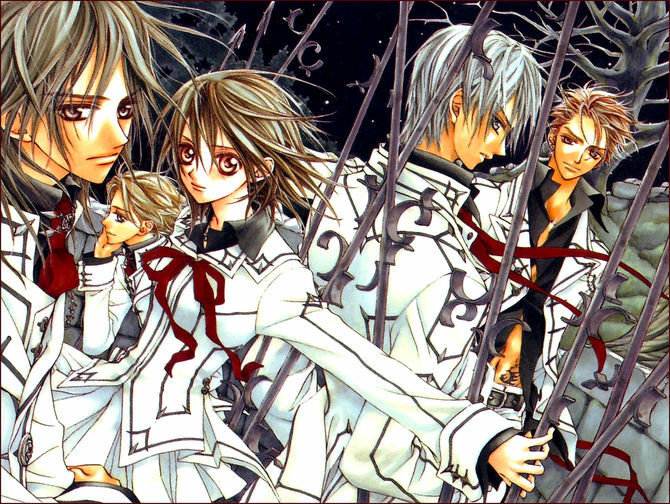 But if you wish to continue on with the story of Vampire Knight, the manga is the way to go. Vampire Knight is one of mystery and drama which takes a new approach to the world of vampires, and making sure that when other characters are linked to that world in some way, it sticks to it and explains it. This complex web makes for interesting moments throughout the story, and at some points you'll probably have different feelings towards the same character(s) as certain events unravel.